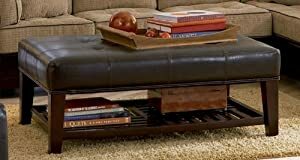 Dimension: 48"L x 30"W x 19 1/2"H Finish: Dark Brown Material: Leather Like, Wood Ottoman with Open Shelf & Tufted Top Dark Brown Leather Like Features storage open shelf and button tufted top. Dark brown leather like top and wooden base. Relax and enjoy your living room with a unique coffee table look item. Matching sectional sofa is available separately.